Prümtal-Camping Oberweis er en campingplass i Oberweis, Rheinland-Pfalz, som ligger ved en elv/bekk. Denne campingplassen har steder med avgrensning, med skygge, uten skygge og plasser med noe skygge. Det er mulig å leie stasjonære campingvogner. Campingplassen har lekeplass og idrettsplass. For sportslige feriegjester arrangerer campingplassen utflukter, fotturer med guide og ulike sykkelturer. Det er underholdningsprogram. Campingplassen har utendørs svømmebasseng og barnebasseng. Det er også vannsklie. I nærheten av campingplassen kan man svømme i en elv/bekk. Denne inspektøren besøker hvert år Prümtal-Camping Oberweis og inspiserer campingplassen for ca. 200 fasiliteter og for andre punkt som forekommer. Inspektøren er en medarbeider fra ACSI og arbeider ikke for campingplassen. Stayed for 2 nights en-route to the black forest. Excellent site with a great swimming pool, restaurant and bar area. Best meal I had on the holiday, would recommend the farmers pot. Not much to do off site but our daughter was more than happy chilling by the pool both days. Germany certainly knows how to do touring sites. This is our first visit and it won’t be the last. The whole experience has been a joy. The campsite is set in lovely surroundings with plenty of points of interest to keep one occupied. Reception staff were helpful and informative. Facilities are first class and our pitch overlooking the river peaceful and attractive. Already looking forward to our next visit. This site totally deserves its 5 star status. The office staff and the campground staff are friendly, polite and helpful. The toilet and shower block are the best I've ever seen in more than 40 years of camping. Immaculately clean no matter what time of day with never a "Closed for Cleaning" sign to be seen. The site staff just cycle through the day (literally) to keep them pristine. The new shower block even has underfloor heating - now there's 5 star luxury for you!! Good walking and cycling from the site, although as you'd expect fairly hilly. Vil du booke campingplassen Prümtal-Camping Oberweis eller få mer informasjon? Det går bra med opplysningene nedenfor eller via campingplassens nettsted. 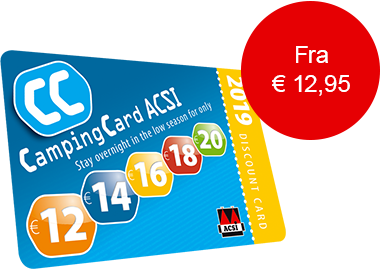 ACSI Eurocampings sender din forespørsel til "Prümtal-Camping Oberweis".